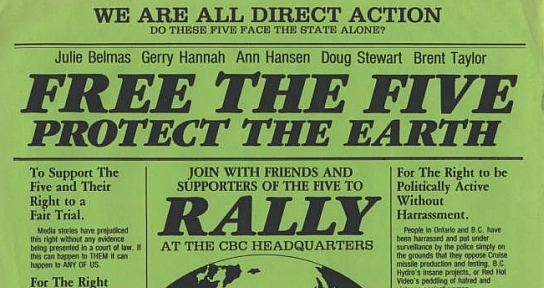 Free the Five, Protect the Earth flyer from the Julie Thiers collection, 1983. University of Victoria Archives preserves and provides access to UVic historical records; private archives of people and organizations relating to the UVic community; and primary sources on anarchist studies, arts and culture, environmental studies, literary history and criticism, political and historical affairs, transgender studies, and women's studies. The following are some of the collections available.